Santa Claus was born in a barn, apparently. Close that damned fridge door, Santa! We’re not made of money! Christmas time is hospitality time. 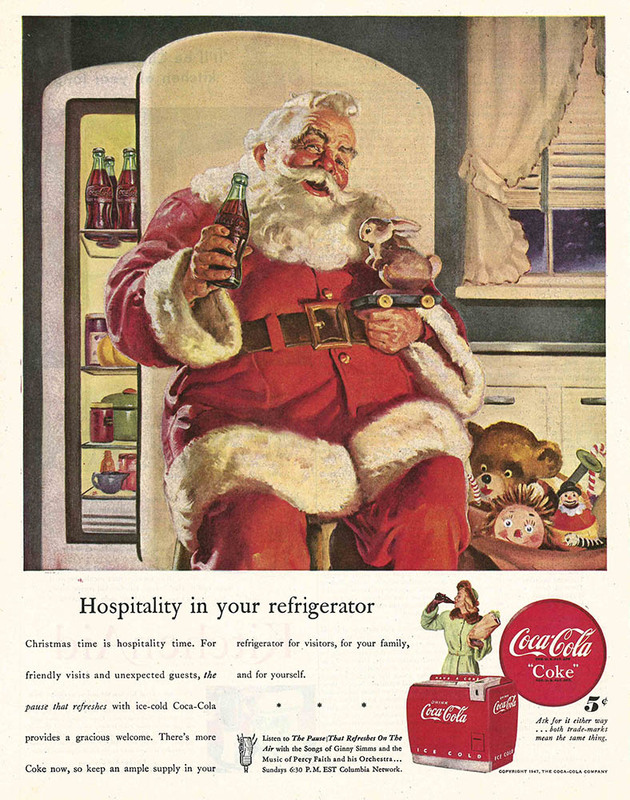 For friendly visits and unexpected guests, the pause that refreshes with ice-cold Coca-Cola provides a gracious welcome. There’s more Coke now, so keep an ample supply in your refrigerator for visitors, for your family, and for yourself. Ask for it either way… both trade-marks mean the same thing. This entry was posted in ads of yore and tagged ad, ads, advertisement, advertising, christmas, coca-cola, coke, santa, santa claus, vintage ad, vintage ads, vintage advertisement, vintage advertising, xmas on December 22, 2017 by Clayton Hove.